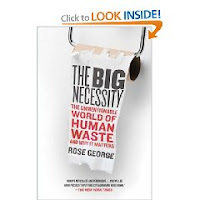 I'm reading "The Big Necessity: the Unmentionable World of Human Waste and Why it Matters. It's really good. Can I state for the record that I've always wanted a bidet? Ever since my 10th grade Italian teacher, Mrs. Cerrelli, told us about them. This line from the book hits home. "[Toilet] Paper cultures are in fact using the least efficient cleansing medium to clean the dirtiest part of their body". But what I'm really excited about is a bio-gas digester. These things are all over rural China and India. They turn your poo and your animal's poo into fuel and fertilizer. That is so cool. It's my dream to have a bio-gas digester and convert my car to run on the fuel from it. And the leftover slurry- you can make even better with vermicompost- another one of my favorite things- and then I could use it on my garden. I'll have the most amazing, organic fruit and vegetable garden. We can have all sorts of adorable farm animals- we'll need their poo. The gas for my car will be free. And I'll be doing a really good deed for the planet- getting rid of all that ozone-destroying methane. I'm so excited about this. (Even though, I know it's decades away- I don't even own a house yet). Edited to add: I researched a little more how to run a car on bio-gas. It's definitely do-able. But moving the gas from the bio-gas digester makes it much less useful/efficient. It might be a worthwhile conversion for a large farm- but probably not for a family bio-gas digester, I'm thinking. So we'll probably just use it for cooking/heating to make the most of it. Bio-gas digesters address global warming, our dependence on Saudi oil, and help the poor live more self-sufficiently. So WHY DOESN'T EVERYONE HAVE ONE? I feel like there is some sort of conspiracy to keep us from this. Another benefit to everyone getting this is that the city sewage would no longer have any fertilizer qualities to it so it would be completely undesirable. The slurry would be completely made of pollutants-like funeral home and hospital and factory waste. Farmers would no longer use that crap on their soil. We would be forced to deal with it in a civilized manner. Companies would have to take responsibility for their dumped toxins. As tempting as it is to "move to the country", build myself a house and have a cute little farm and live out my crunchy dreams... I think the much more responsible thing to do would be to live in the city- own a multi-family home with a small yard, build a bio-gas digester there, plant a multi-layer garden, and be an example to the community of how do-able this is and how beneficial it can be to every family. But you can't use human poop in fertilizers right? Because of risk of E-coli. I use my bunnies' poop in my composter and it's awesome. Bidets were not that uncommon in the UK. the hospital I had my first daughter in had them for post partum women to cleanse their tender bits, and it was wonderful. It does make sense, to give it a good proper cleaning, instead of just wiping with a piece of thin paper. The anaerobic digestion that occurs kills e coli and most other harmful bacteria. I'm not sure that it kills everything though. I'll have to keep researching. But if it's not, you could use some sort of ozone to disinfect it. I don't know how much that would cost.